Zosia Busé is a junior from Shenandoah, Virginia. She is majoring in International and Global Studies, and triple-minoring in Peace, Conflict, and Coexistence Studies, Social Justice and Social Policy, and Legal Studies. Her coursework focuses on ways that cross-cultural communication can be utilized as a tool for conflict resolution. On campus, she is involved with the Undergraduate Student Union as the Student Representative to the Board of Trustees, she is the Chair of ‘deisIMPACT! Festival of Social Justice, she is an ambassador for the Brandeis National Committee, and she is a Community Advisor with the Department of Community Living. She also works in the Sociology department. 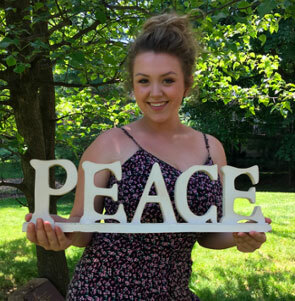 She recently completed an internship with Nonviolence International in Washington D.C., conducting research on nonviolent intervention in Palestine. Zosia loves being a PAX minor and is happy to talk about possible peace and conflict-related careers, PAX internship opportunities, or anything PAX-related. Feel free to reach out to her if you have any questions!